Jesus tells the disciples to listen to the Pharisees but not to be guided by what they do, as they do not practise what they preach. Who do you take as an example to learn from? Is there one person who inspires you? Who has taught you what it means to do good and search for justice in our world? Angela volunteers for CAFOD in her parish in Barnet, north London. Every Family Fast Day, she helps organise a soup lunch, so that her community can share some simple food and raise money to help their sisters and brothers in need. Angela also used to go into schools to teach pupils how they can help children just like them around the world. On one visit she had given her talk and was about to leave, when she was asked to speak to the nursery children too. She wasn’t sure how much the little ones understood. But next time she went back, she heard that one of these children had explained all about Fast Day to her mum. Angela is just one ordinary person doing what she can to try and make the world a better place. She seeks to help others throughout the world and to encourage others to do the same. And there are so many more people throughout the world, like Angela, all trying to do good, to help those who are oppressed and build a fairer world. What could you do this Lent? God of justice, give me the strength to do what I know is right. Lead me to help others and to encourage those I meet to do the same, so that all people may flourish. Amen. Find out more about how you can get involved as a volunteer CAFOD speaker like Angela. 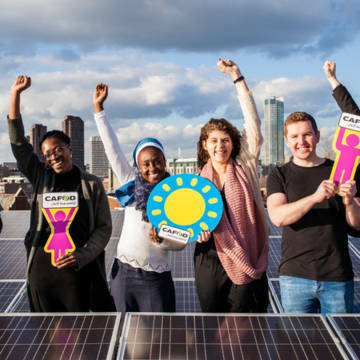 Find out about opportunities to volunteer with CAFOD.